Tuesday February 25th 1896 I hurried through the work and had dinner by eleven oclock. The boys rode down town with us. Went on over home. Lee was down to dinner. I spent the afternoon pleasantly with Mother. The folks went back to Des Moines this morning and Hattie and Edith went with them. I worked on the rug in the evening. Wednesday February 26th 1896 Will and Hugo walked down town today. I did some extra work about the house today and baked bread. I worked some on the rug. It was as warm as summer. 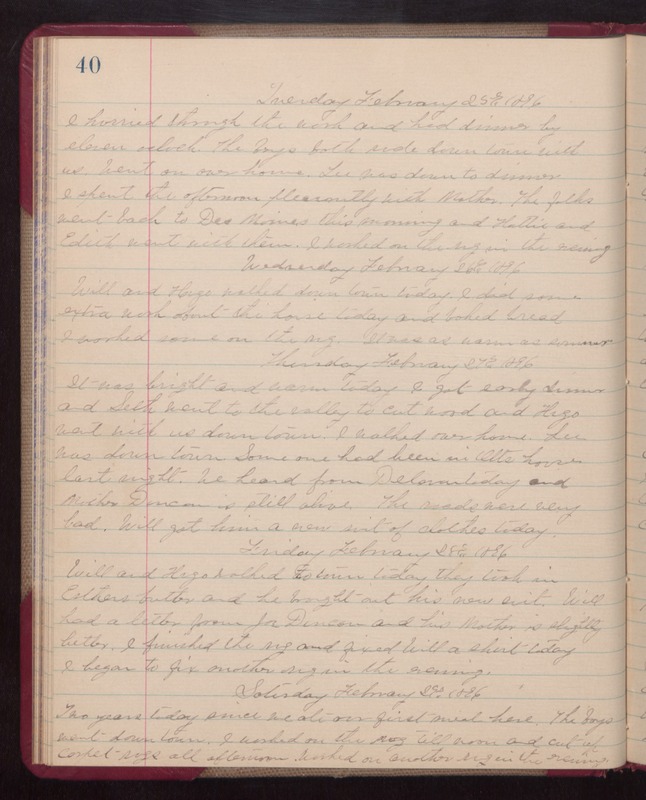 Thursday February 27th 1896 It was bright and warm today. I got early dinner and Seth went to the valley to cut wood and Hugo went with us down town. I walked over home. Lee was down town. Someone had been in Otts house last night. We heard from Delavan today and Mother Duncan is still alive. The roads were very bad. Will got him a new suit of clothes today. Friday February 28th 1896 Will and Hugo walked to town today, they took in Esthers butter and he brought out his new suit. Will had a letter from Joe Duncan and his mother is slightly better. I finished the rug and fixed Will a shirt today. I began to fix another rug in the evening. Saturday February 29th 1896 Two years today since we ate our first meal here. The boys went down town. I worked on the rug till noon and cut up carpet rugs all afternoon. Worked on another rug in the evening.